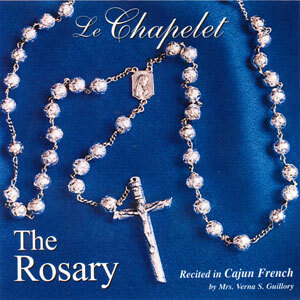 Le Chapelet (The Rosary) recited in Cajun French by Mrs. Verna S. Guillory. 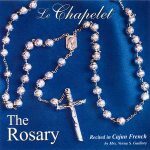 Included are: Les Mysteres Joyeaux (The Joyful Mysteries) [24:30], said on Mondays and Thursdays, and the Sundays from the First Sunday of Advent until Lent, Les Mysteres Douloureux (The Sorrowful Mysteries) [23:55], said on Tuesdays and Fridays and the Sundays of Lent, and Les Mysteres Glorieux (The Glorious Mysteries) [24:36], said on Wednesdays and Saturdays, and the Sundays from Easter until Advent. Proceeds from the sales of this item goes to charity.